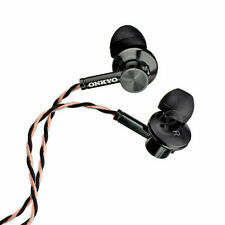 Onkyo E700M Earbud Hi-Res In-Ear Headphones with MIC - Black. Here is a rare opportunity to own aNew (Never Used) & 100% Authentic Onkyo E700M In-ear Headphones with Microphone. Onkyo E200MB In-Ear Headphones. Here is a rare opportunity to own aNew (Never Used) & 100% Authentic Onkyo E200M In-ear Headphones with Microphone. Onkyo E700MB In-Ear Headphones. Earphones & Headphones. Grado iGrado On-ear Neckband Headphones. For sale is one pair of Onkyo IE-FC300(V) In-Ear Headphones, Violet color. It is used condition. Could be a loose connection on the cable. Seems to work fine afterwards. Keep this in mind before buying. To bring proven Onkyo sound quality and the potential of big-screen video playback to your iPhone or iPod, look no further than the UP-A1. ONKYO UP-A1 Dock for iPod new open box. Supports Video Playback and Photo Slide Shows on iPhone, iPod touch, iPod Nano (3rd, 4th and 5th Generation) and iPod classic. ONKYO H500BT Wireless Headphone Bluetooth Hi Resolution H500BTB US SELLER! These Onkyo headphones sound great. The cheapest I can find pre-owned is 135, so for this price these are a great deal. Fixed cable onkyo iPod dock. Used with onkyo Receiver Great condition. Includes: Speaker, Power Adapter, USB and Aux Cord. SKU: 1SD-4PC-Onkyo-BTSpeaker-X3Blk. New, in open Box. Bluetooth wireless portable speaker capable of reproducing high-resolution Audio via USB audio-in. Audio in and headphone out connections for versatile listening experience. 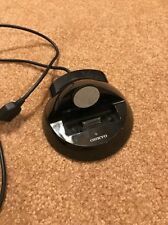 Onkyo Interactive Remote Dock. Tested: Functional. Excellent condition with no visible scuffs or scratches. Used sparingly. These headphones have very good, crisp highs and mids with clear and not overpowering bass. Inline mic and button controls designed for perfect pairing with apple products. 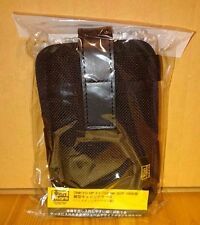 Comes with original packaging and dust bag. (please check pictures for condition). Please let me know if you have any questions. Thanks for looking! Onkyo H500BT Headphones. -User manual. -USB charging cable. 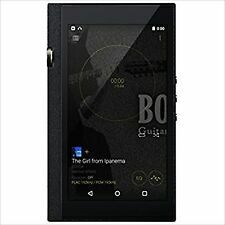 ONKYO Hi-Res Audio Player 32GB DP-X1 Fast Shipping. Condition is Used. Shipped with USPS Priority Mail. Trending at $320.00eBay determines this price through a machine learned model of the product's sale prices within the last 90 days. Onkyo UP-A1 Dock for iPod, Black BRAND NEW IN PACKAGE. Condition is New. Shipped with USPS First Class Package (2 to 3 business days). BRAND NEW IN ORIGINAL PACKAGE NEVER USED! Opened to take pictures but item inside is still sealed! Onkyo DP-1Xa Black - Used Excellent Condition. W800BT - S/N: 3FOA1617001355 2016 - Made in China. Both show signs of light scratches (picture #3, 6, 10 & 11 show the best details). Pictures are of actual item(s) for sale. RIGHT Earphone ONLY w/Charging Case. The ABX-N300 is just another stylish iPod/iPhone audio system, right?. Its so much more than that. Sure, the sleek, sliding aluminum top-panel conceals a dock f or iPod/iPhone. But beneath that, youll find advanced wireless audio functionality suppor ted by impeccable Onkyo audio engineering. The seal is still in place. For sale is my used Onkyo DP-X1 audio player. Bundle includes an Onkyo DPA-PUX1 leather case and an already installed tempered glass screen protector. The original run of this audio player had some headphone jack spacing issues that I fixed up by filling the gaps with Sugru Rubber. Check out the photo for more detail. This player sounds amazing and there are only some slight scuffs on the top of the player around the phone jacks. #3002296700 (SD). Onkyo X3 OKAX37B/37 wireless portable bluetooth speaker - black (S/N: AJOA1616000001). Overall it looks gently used, nice and clean. Pictures are of actual item(s) for sale. Pictures are of actual item up for sale. The Onkyo G3 Smart Speaker has the Google Assistant built-in. Just say 'Ok Google' to start a conversation with your Google Assistant. Pick up the speaker and hold it in your hand. You'll notice its weight. Onkyo DS-A2 Interactive Dock For iPod with remote. Onkyo ES-FC300W. On-Ear Headphones (White). Drivers: New 40 mm (1 9/16) Wide-Range Titanium. Driver Housing & Arms: Aluminum. Model / Serial ESFC300W / 510261. Earpads: Leatherette. Headband: Adjustable and Padded. Onkyo X3 Wireless Bluetooth Portable. Audio Music Speaker, Black NEW. 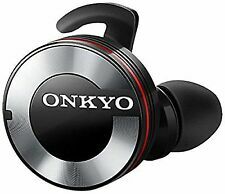 ONKYO W800BT Black Bluetooth Earphone Left Right Separation Canal type Japan F/S. ■Connection: Bluetooth. ■ Bluetooth Version: 4.1. ■ Bluetooth profiles: A2DP, HSP, HFP. ■ mass: Inner Ear part 7.5g (1 piece) charging case portion 98g. This unit works ONLY with Onkyo Products with Universal Port. NEW ONKYO E300M In-ear Headphones. These are brand new in the factory sealed box. Free Shipping with Buy It Now in the US Only. I can't use it as it turns out, since I don't speak Japanese. Condition is New. 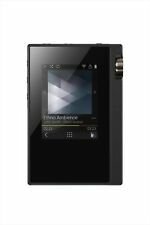 It’s an incredibly compact and versatile player for hi-fi audio on the go. Drive any headphones and connect any stereo via line or USB/OTG , or use Bluetooth for a quality wireless connection. 100% genuine onkyo earphones,new never used, but no box, the same as the photos showed, with a generic package we have two color for this item, Black and White color, this listing is for black color, if you need the White Color, please feel your free to leave a note on message, so we can arrange it for you. Type: Inner-ear headphones with microphone Model: semi-open Housing: Aluminum Magnet type: strong magnetic force rare earth magnet mounted driver Speaker diameter (mm): φ13.5mm Play frequency band: 6Hz-40kHz Hi-Res: Supported Maximum input: 30mW Sensitivity: 108dB / mW Impedance: 32Ω Cable length: 1.2m Connection terminal (connector finish): φ3.5mm gold-plated Cable type: twisted cable Code Type: Y-shaped Mike: Yes Volume control: No Play / Pause control: Yes Body mass: 18g. This Onkyo ND-S10 has USB port that allows you to play music on your PC digitally via Itunes. Feed Apple Lossless files from your Ipod, Iphone, Itunes, to DAC or digital recording device such as minidisc. Up for sale is one ONKYO DAC-HA200 D/A Converter / Headphone Amplifier . Item is brand new in the box never been opened. Up for sale is one ONKYO ES-FC300 W On-Ear headphone White. Item is brand new in the box never been opened. IOnly Bass: Dock Music System. iPad/iPod/iPhone Audio Connection and Power Recharging. 20 watts per channel. Digital Amplifier Circuitry to Maintain Clean Audio Signals. Sounds great and is in excellent condition. New ListingOnkyo DS-A2 Interactive Dock For iPod WITH remote "Slightly Used"
Onkyo DS-A2 Interactive Dock For iPod with remote. Owned but slightly used. All components and User Manual included. Shipped with USPS Priority Mail.